In case you all didn't know apparently this is Wovember, it's a bit like Movember but for knitting and with less elaborate facial hair. While I am altogether more adept at cultivating facial hair than I am at knitting, nonetheless an unexpectedly large number of my friends are practitioners of the woolen arts. The fabulous Felix has written a rather comprehensive post over on The Domestic Soundscape that will tell you everything you need to know about Wovember and then some, and Léan over on String Revolution manages to thread a good few puns into her needlework posts, but this month the Unkie Dave prize for contributions to the Woolen Arts goes to (as it does most months) An Snag Breac for her knitted Molotov Cocktail. Ms Snag Breac, as I'm sure you all remember, is the creator of my fantastic extermi-knitted Dalek and the nearly life-sized woolen Pancreas that functions much better than my real one. Her comercial kits range from felt solar systems and sheep, to patterns for knitted CCTV Cameras and cartoon bombs. Her designs always bring a smile to my face and almost make me want to put away my electronic noise makers and take up crafting as a hobby. You can find out more about her latest revolutionary design here, where the pattern is also available to buy for the princely sum of €3.50. 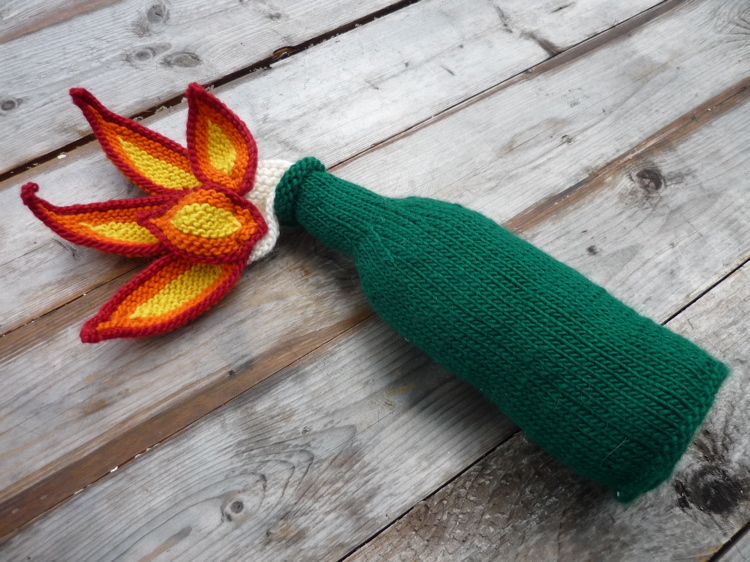 Does hurling a knitted Molotov Cocktail still count as a peaceful protest? Yay! Whats my prize Unkie D! Can I put that on my cv - winner of the november 2011 Unkie Dave prize for contributions to the Woolen Arts? Thanks for all the plugging!